Hyperfly Do or Die is a family owned business that sells Brazilian Jiu-Jitsu gis and rash guards. The Pakter family found Brazilian Jiu-Jitsu when their 11-year-old son, Luke (now 16) started taking classes at Gracie Barra Academy in Encinitas taught by Professor Nelson. Kerstin Pakter, Luke’s mom, felt that if a sport could make this kind of a difference in her son she needed to learn more. The more she learned the more she fell in love with BJJ. I sat down with Kerstin to talk about the company, her roots, her family and what Hyperfly is made of. It was a sunny, windy day at on this southern California beach. The ocean was an unusual shade of jade green. Kerstin ordered a coffee with a little foam and I a double latte. We talked for over an hour and a half. Here are the highlights from our conversation. BJJL: Hyperfly is a very striking looking gi. Are you marketing Hyperfly as a status gi? Kerstin: Not really. It should be… It should be a tool to perform. It should be something which you can afford and wear. It is equipment for doing your sport not for looking just pretty. BJJL: I assume you would be a fashion brand. Kerstin: It’s functional and it’s beautiful like the sport of Jiu-Jitsu is beautiful. When you see some gis, they have all this embroidery and patches everywhere. It makes the gi heavy and because of that, the competitor has to cut more weight. I see athletes standing on the scale, “A hundred grams. No! No water!” And I’m like, “Guys! Think about the athlete! They need to cut weight. So every gram counts. Come on, guys.” We’ve got to make gis lighter. We’ve got to do less patches, less embroidery. We do have gis with embroidery like the new YCTH line, but our main focus on the classic. A gi is a very expensive item. And we want to get our price structure for our gis even lower. In the future, we’re going to have a $99 lighter weave gi for beginners to start. BJJL: Ooh. I like this. Kerstin: In retail. That’s the future. And our most expensive, we’re going to have very, very few gis, maybe few models that are going to be over $160-$180. BJJL: What? That’s your highest? $160 is middle-of-the-road for gis. Kerstin: Right now, we have gis that start in a range from $149-$180. Beside our signature gis like for Xande, which goes for around $240 and special editions. Take for instance our rash guards; make them specific for the people who request them because we can do these small limited runs. We don’t force-feed them. And that’s one of the things what’s also very important. That we don’t try to do everything and be everybody’s darling. We are not a fashion and we don’t change constantly. We try to stay consistence with our products. Like the Hyperfly™ cut has never changed. We have the Pro Comp™, which is a different cut, but otherwise once you have a Hyperfly you know the fit. It is like Nike shoe, size 12 always fits the same. BJJL: How did Hyperfly happen? September 2011 is when we did the first Hyperfly. Before we were making kimonos for Ribeiro BJJ. 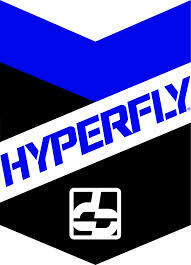 Pascal [Kerstin’s husband and co-owner of the company] came up with the name Hyperfly. So actually, Hyperfly is now just three years old. It’s not very old when you think about it. BJJL: How did you guys come up with You Can’t Teach Heart? Kerstin: When we went to tournaments and we gave out Do or Die key liners and spoke to athletes. We had no sponsored athletes, nobody knew us. We went to all of the tournaments. People came up to me and said, “Oh, my god, K’. You put so much heart in there. You really mean it.” And then Pascal said, “You Can’t Teach Heart. This is what it is. BJJL: Your company grew so fast, US, Europe and Asia. What is your background? Kerstin: I come from sales and marketing. I have doing sales and marketing my whole life. I was the general manager for Emu Australia Europe, an Australian sheepskin company for six years. Before Hyperfly Pascal and already had Daddy’s Distribution. We were importing U.S. brands like Phat Farm and others. We worked with Russell Simmons. Before that, we imported a Damon Dash and Jay Z brand called Roc-A-Fella from Roc-A-Fella Records. We brought American hip-hop brands to Europe. We met some really funny cats during this time, parties with Nas, Jay Z and TLC in Vegas and NY – no Joke. The 90’s were great. We sold like crazy. But then came the fall of the whole… Well, it was a global recession. 2008 is when we decided to go to America. Because we knew when the Lehman Bank and rest happened, we just had to leave Germany, things were turning ugly worldwide. We choose to move to California, San Diego because this is still the place where your dreams can become true – The American Dream. It’s not that easy anymore, but if you work hard, you can make it. BJJL: What part of Germany? Kerstin: Hamburg. We always lived well off importing but it was never like it is now, where you really can start a movement. Where you can excite people, where you can really see the growth. Like getting bigger and stronger and actually create something with a soul and meaning for the future. This can go on for the next 20 years, if you just keep doing what you do, especially with something like BJJ. Jiu-Jitsu has just started to become popular and one day it will be a major sport like football and soccer. BJJL: How did you avoid being taken advantage of? Kerstin: Okay. I’m not 20’ anymore. There is an experience what comes with being. I’ve been around sales business since I was let’s say, 14 years old. I come from a family in the garment industry. My uncle owned Checker and worked with Fiorucci, which are Italian brands. Those brands very huge in the 80’ and wild. I grew up on these trade shows working for all those brands. I was 14 years old, doing the door, writing down the customers’ orders, showing them the collection and I watched people making deals. I was always in this selling, marketing, fashion. I have seen people getting screwed so many times that this taught me to be more cautious. I traveled a lot, lots of travelling makes you smarter. Pascal, studied at UCSD majoring in marketing and communications. He is a production guy. He does production for many of the big lifestyle brands. And he knows all the big players from Europe to Asia. He does 90% of the designs together with freelancers. He has the vision; he is the brains of the company. BJJL: Hypothetical question, would you go on Shark Tank and sell equity in your company for say, $3 Million dollars? Kerstin: No. we don’t want to do that. Pascal and I, we don’t want some big bucks guy who comes in and say “Okay, now just numbers count. No more spending money, on so many sponsorships and things.” We do just that because of love for the sport. And that’s why we always say, our company motto, You Can’t Teach Heart, it’s not a tagline. It’s really what we live day-by-day. My son and my daughter, Sophia and Laurenz they both work full time in the company. (They call them the Hyperfly Twins.) When you own a company – it’s like a baby you take care of it 24/7 and that’s what we do. BJJL: I know that you get many requests for sponsorships. What is your team looking for in a sponsored athlete? Kerstin: Okay. So let me see. It’s like this; when we get an email saying, I want this, and this, and this I love Jiu-Jitsu and I think you should sponsor me, we don’t even answer. The email gets deleted. If I get an email saying, hi, my name is this and this and that, I fell in love with Jiu-Jitsu because … I have people write, I got introduced to BJJ because of …or it changed my life my path, then we are definitely going to answer. BJJL: Back to the motto, You Can’t Teach Heart. Kerstin: Yeah. There has to be a story. We don’t want people like, “I’m the coolest guy, you better sponsor me.” I don’t care if you’re the only person that wins every tournament. We would not sponsor you because you don’t fit with our philosophy of the company. We want to have humble people. Look at all the athletes we have, the kids competition team. They’re all humble athletes. We have 18 full-sponsored kids and 15 Adults. We do get togethers or things like the beach party you saw; where we did the little video, we put mats on the beach. We rolled at the beach. We had a bonfire/ BBQ and just had a good time. BJJL: And the surfboards. That was cute. Kerstin: Yes, the surfboards were cool. Those kids are on the mat, competitors. They face each other very often because a lot of them are in the same bracket. Before the Hyperfly Team, they knew each other just from tournaments. Now, being in the Hyperfly Team, they became friends. When we go to the tournaments, we make sure that we get all the kids together on one picture and that they hang out. And we have an acai bowl together and they have fun after they might just faced each other on the mat, that’s the beauty of having this team. They became friends. You need people to set an example. And you need to get a strong voice so that the rest of the world pays attention to the sport. , I love the sport, and we will do everything what’s in our power and what we can do with our budget to get Brazilian Jiu-Jitsu out there, to spread the importance of having kids joining the sport and specially girls. BJJL: Phew! You’re on fire. You are so passionate. Kerstin: You know, really, I am. I feel like, to me this is not work this is my way to do something with a meaning and fun, BJJ is so much fun… I’m so thankful and grateful that I can do this with my family together -that’s the best of all. BJJL: Let’s go back to the kids for a minute. All your all your sponsored kids, are they all from Southern California? Kerstin: No. We have kids from Florida. We have kids from Oklahoma. We have kids from Texas and Mexico. We have kids from everywhere. I believe we are the first Brazilian Jiu-Jitsu company that has a kids competition team formed from different academies around the country and not just sponsored but actually a real team. We are very proud of this. BJJL: Would you rather sponsor a black belt who’s been a world champion or a promising but unknown purple belt? Kerstin: A purple belt. Because the purple belt with a lot of heart is going to be, one day, a black belt with a lot of heart. And he’s going to be the one that I can identify myself with. A black belt with no heart is like a banner hanging somewhere, dead. Kerstin: That’s how I see it, just a banner. BJJL: Xande Ribeiro, black belt, world champion and Hyperfly sponsored athlete and spokesperson. The world loves Xande on the mat. Kerstin: He is magic. To me, he is the Michael Jordan of BJJ. Everybody loves Xande. 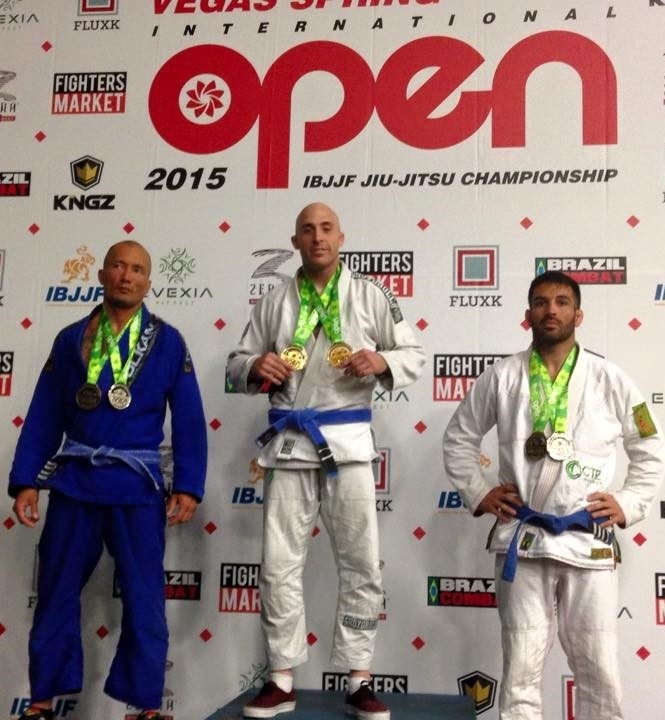 Xande has matured into a natural leader and world ambassador for Jiu-Jitsu. Clearly, his record speaks for itself. He was recently induction into the IBJJF Hall of Fame alongside his older brother, Saulo. His numerous accomplishments solidify his permanent status as one of the greatest Jiu-Jitsu fighters in the history of the sport. Still here is so much more to Xande that cannot be defined…He is kind, shows no ego and always cares. BJJL: Does Hyperfly have a hemp gi? Kerstin: No not yet. But we made one for Anderson Silva. Beautiful gi. BJJL: Did you get your hemp from Pakistan? Have you had your hemp tested? Kerstin: It was only Marines. We are going to make an Army gi. Military gis are difficult. First, we have to get the license from the Pentagon for the Marine Corps insignia. Then we have to get insurance in order to use their insignia. Because if anybody was hurt in it they could sue the government. Kerstin: No, its business. If you’re in this business and you want to be around more than a year you do things right and don’t get sued. That’s another thing, say you take the Olympic rings and just put them on a t-shirt. Kerstin: It’s infringement of a trademark. You can’t do it. We brought out an Olympic gi. The World Cup of Soccer and the Summer Olympics are both taking place in Brazil this year. An Olympic gi is a natural. When you look at our Olympic gi, we have changed the rings and the colors. You’ve got to respect the trademark of others. We want to be taken seriously. We are trying to be consistent with a good product, a good price range. And we listen to what people want. Right now, we are making rash guards and fight shorts for the EA Sports team. I’m going to send you pictures of the samples as soon as they’re done. BJJL: What is Hyperfly Productions? Kerstin: Well, Hyperfly Productions was founded by Joseph Renteria, Laurenz and myself, together. Because when we did our first highlight video, I think it was 2012, at an IBJJF tournament. I don’t know if it was World’s, or World’s Masters. We got so many people that thanked us for not just filming our athletes but filming the sport in general. So what happened then, because everybody loved it, Anderson Silva hired us to film his opening for his Muay Thai college in Torrance. Then Rener hired us to do his Anti- bully video. Joseph actually filmed Rener Gracie wedding and Five just signed a contract with us. We’re doing their highlights wherever we can. We love what FIVE is doing for the sport – great concept. BJJL: Do you ever give gis away? Kerstin: I want to start, probably after worlds, a program where you send us your old gi and you get 20% off purchasing a new Hyperfly gi. We pay for the shipping and everything. That means, people that want to buy a new gi would get a huge discount, maybe even 30%. We still have to do the numbers. But for this, we want your old gi. That old gi is going to back to Elena and her Give the Gift of a Gi foundation. Because I think we, as a gi company, we should start recycling. Or you don’t even have to fly to Brazil. I live in Encinitas and two blocks away is a homeless shelter. I feel like we can help people here at home. We should start this. People are always asking for a discount. I’m going to ask them, give me their old gi; they will get a percent off, like 20/ 25 percent. Kerstin: Then we collect those gis and we give them to gyms that need loaner gis, or they need gis for kids who cannot buy a gi. Some kids cannot start training because the parents don’t have $100, because the whole family eats for the week from that $100. BJJL: Did you read the story that one of Elena’s gis went back to one of the kids in my class? She came to me in one of my classes. Two of my little boys trained without gis, their mom can’t afford them. The mom can’t afford it because she just went through breast cancer. While she was in her second round of chemotherapy, her husband died of a heart attack. They lost their house. She doesn’t have medical insurance and he didn’t have a life insurance policy. Now she’s raising three kids on her own while she goes through her chemotherapy. So her kids got some of Elena’s gis, which is exactly how the program is supposed to work. Kerstin: How does she pay for the jujitsu class? BJJL: I’m teaching it; so it’s free. We trade. She ties everyone’s belts so I don’t have to. Kerstin: This is what I mean. We all live here and some people forget that. And we all say this is such a gentle sport and this is about sharing, this is about caring. So let’s do that. Let’s make that sport alive. BJJL: I’m honored you thought of BJJ Legends. Thanks for the interview. We don’t talk enough. Kerstin: Laughs. No. Because this is the first time that I’m giving an interview. My first interview about Jiu-Jitsu. I’ve never talked about it. Never really wanted to make a big thing about it. BJJL: You are a big thing. Kerstin: Just a minute, can I thank some people who make it all possible? I’d like to thank everybody that supported our company, joined the YCTH movement, and believed in what we are doing. We are a very young company in a young sport and we will grow together and spread the Love for BJJ. But especially thanks to our athletes and our kids’ competition team – you guys make my heart jump all the time when I see you. That’s priceless!